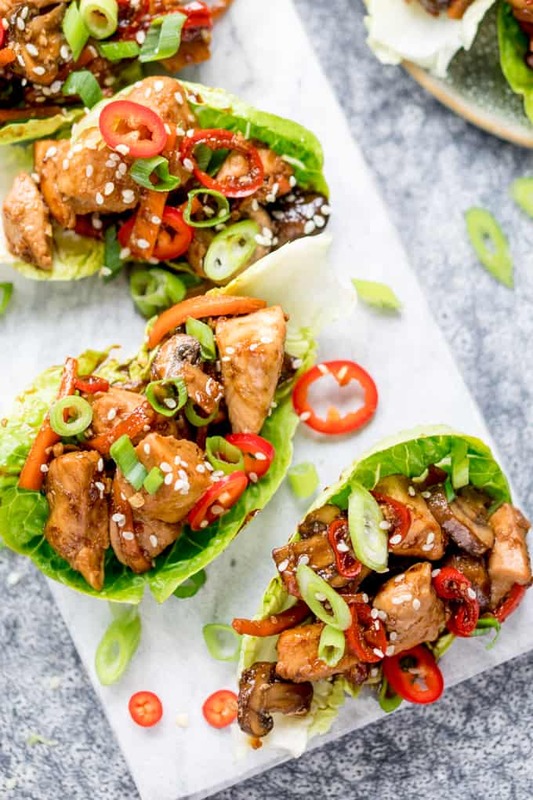 These Asian Chicken Lettuce Wraps are juicy, spicy, fresh and delicious. A fantastic lunch or appetiser. Plus they’re less than 100 calories each hoooorah!! Just feed me lettuce all day…. 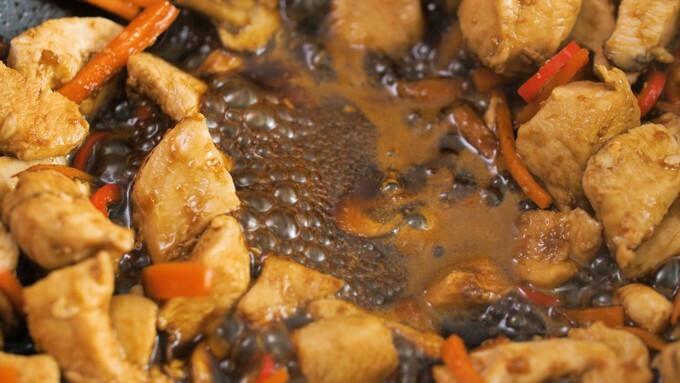 So long as it’s filled with sweet and spicy chicken, juicy mushrooms and crunchy carrots. 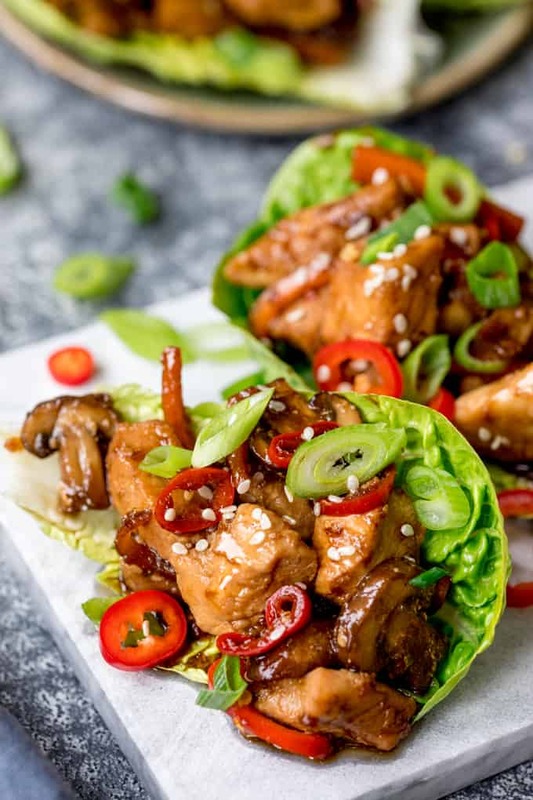 These Asian Chicken Lettuce Wraps really makes a fabulous lunch, and they can also be served cold as a kind of chicken salad minus the cutlery. 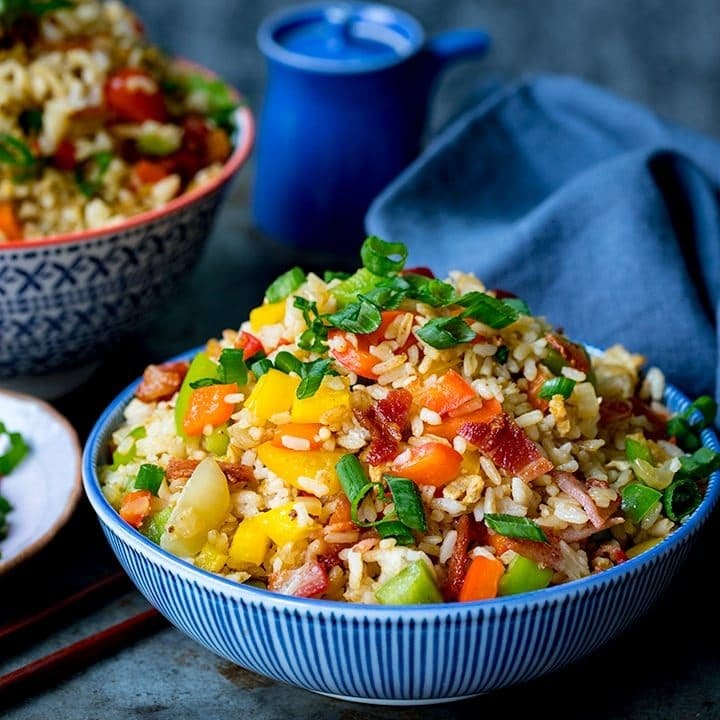 Did i ever mention that i LOVE making Asian recipes? 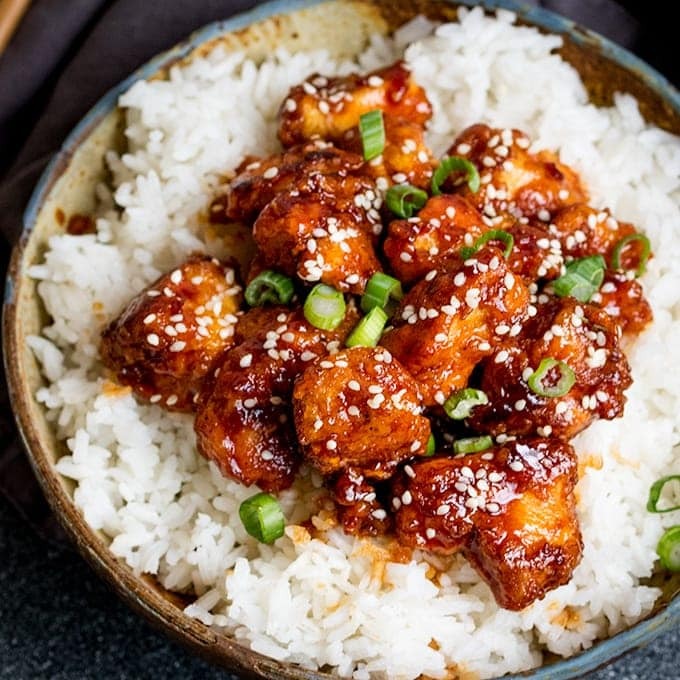 🙂 These are the perfect appetizer or party food and love to serve them along side my Sticky and Crispy Asian Chicken Wings and my Cauliflower Wings for parties. It’s also ready in 20 minutes, which is perfect for me right now, as I seem to be ridiculously busy at the moment. Trying to get everything done before the kids finish school for the Summer. Gracey finishes next week, and Lewis finishes a few days later (he’s NOT happy about that!). We’ve got lots of things planned for our Summer staycation – including Alton towers, a few days in York, Cadbury world, wildlife parks and Albert dock. We considered going back to Legoland, but I managed to talk everyone out of it. It was fun last time we went – the rides were great and everything. But…..
Flippin stuff get’s everywhere. One thing that drives me mad is when I’ve just tidied and hoovered the living room, then I walk into the kitchen, and behind me I hear that familiar loud ‘Whoooosh’ as 5 million pieces of lego are tipped out of the lego box across my whole living room floor. I take a breath and walk back in. I try to step over the lego and the kids (and Chris too – he’s definitely NOT a lego hater) with a loving and indulgent smile on my face. Then I usually stand on a piece and hop around whilst trying to keep to words like ‘ouch’ and ‘owie’ – rather than the ones I’m thinking in my head. Give me colouring books, board games and train sets, but please not the lego. So I hunker down, futiley looking for a ‘bluey-black-two-er with a yellow dangly bit’ – or some other obscure piece that Lewis can’t find (that I probably hoovered up last week). And once we’ve given up on that, I’m expected to produce some amazingly futuristic vehicle to ferry all the evil lego figures about. Chris makes some truely amazing creation that the kids ‘ooh’ and ‘ahhh’ over. I make something that looks like it’s off ‘scrap-heap challenge – the failures‘ – that falls apart at the merest touch. I’d like to say that the kids look at me affectionately and pat me on the back. But actually they just say ‘that’s rubbish mummy’, and I forlornly agree. You can replace the chicken breast with chicken thigh, or even beef/turkey/pork mince. 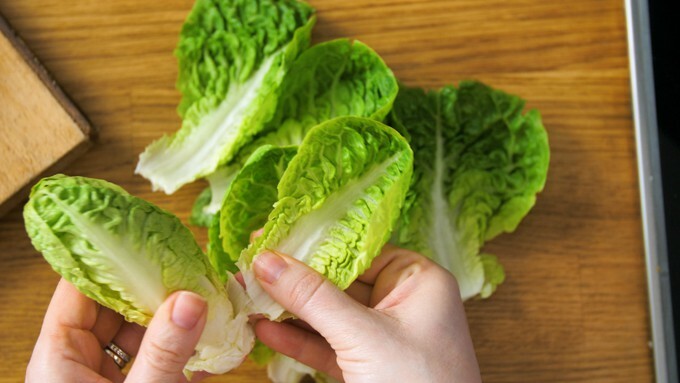 Little gem (which is are small Romaine/Cos lettuces) is the perfect lettuce as it’s small, crunchy and holds its shape well, but any small crunchy lettuces leaves are fine. Chicory works well. If you want the sauce a little thicker, stir in a little cornflour/cornstarch slurry (1 tbsp cornflour mixed with 2 tbsp cold water) a splash at a time until thickened to your liking. Yes! 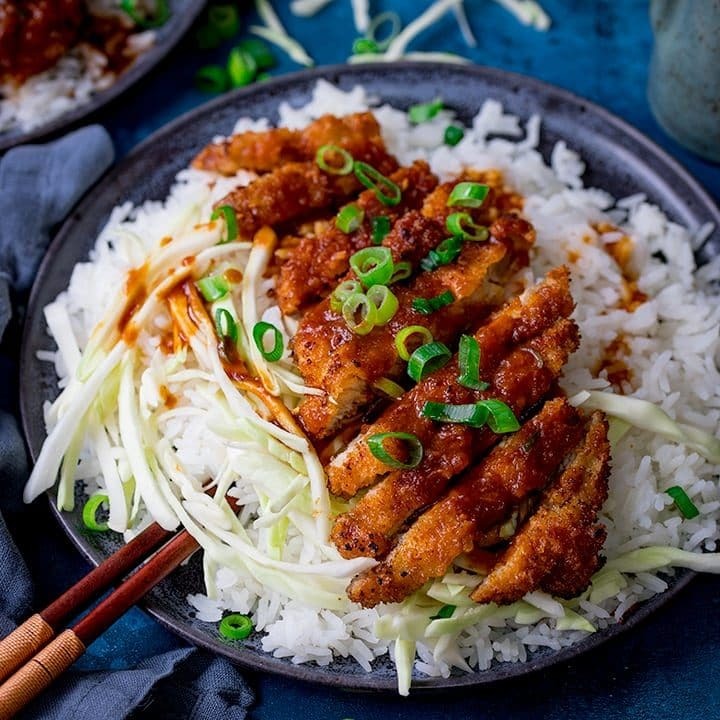 Replace the soy sauce with 2 tbsp tamari and 1 tbsp water mixed with a pinch of bouillon ,or instead, you could use 3 tbsp GF teriyaki sauce. Yes, you can make the filling ahead, then cool quickly, cover and refrigerate for up to two days. 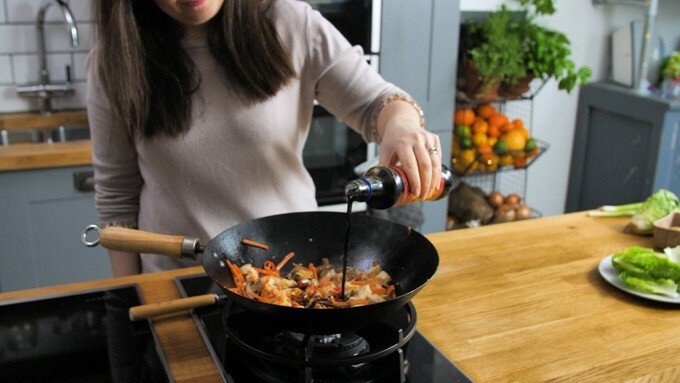 Reheat in a wok with a splash of water until piping hot throughout. It’s not a good idea to make the whole thing ahead, as the lettuce will go soggy. 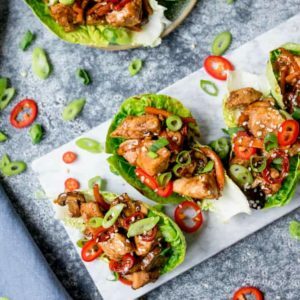 Juicy, spicy, fresh and healthy - these Asian lettuce wraps have got it all! Heat the oil on a high heat in a large frying pan and add the chicken. Cook for 5-6 minutes, turning regularly until the chicken starts to brown. Whilst the chicken is cooking remove and wash the outer leaves from the little gem lettuces. You'll need 10 of the larger leaves. Pat them dry and arrange on a plate. 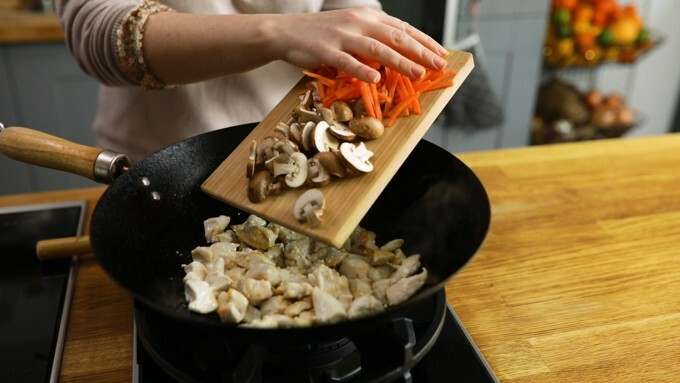 Add the carrots and mushrooms to the chicken and cook for a minute, then add in the garlic, ginger and chillies and cook for another minute. 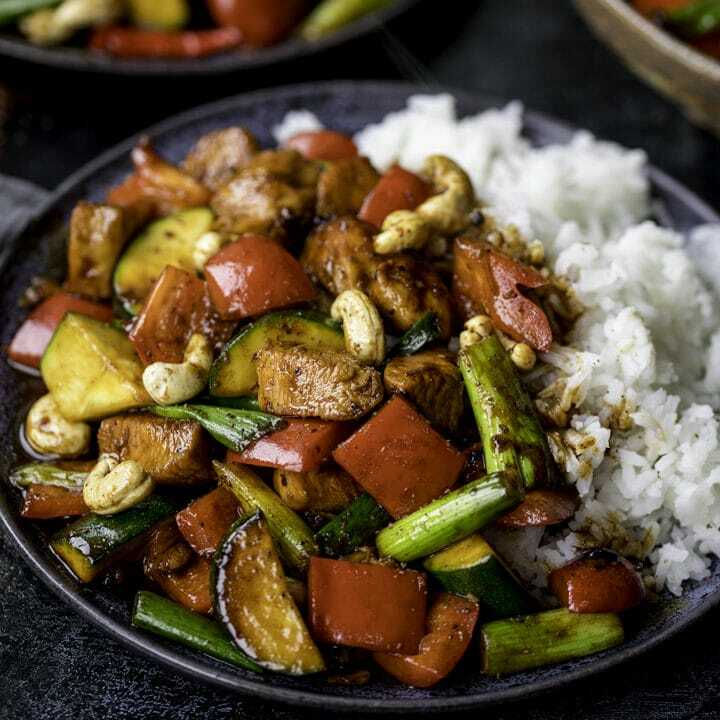 Spoon the chicken mixture out into the lettuce leaves and sprinkle with sesame seeds, spring onion and chilli slices. Little gem (which is are small Romaine/Cos lettuces) is the perfect lettuce as it's small, crunchy and holds its shape well, but any small crunchy lettuces leaves are fine. Chicory works well. It's not a good idea to make the whole thing ahead, as the lettuce will go soggy. Nutritional Information is per lettuce wrap. This recipe was first published in May 2015. Updated for July 2018 with prep photos, new finished photos, video and pro tips. I saw your recipe yesterday evening, just as I was leaving the office, and thought “yes”. Made it last night, and it tasted as good as it looks! Another great recipe, and done in just under 20 mins too! I had to promise my gf i’ll make it again next week. 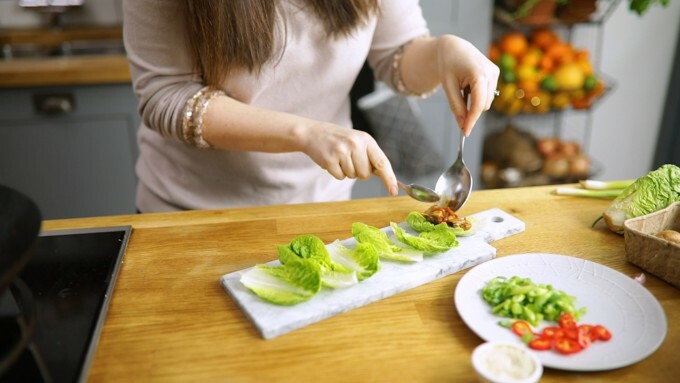 I love lettuce wraps and your photos have me drooling! Hey Nicky, I saw these on Food Foto Gallery and just had to come see them for myself. These look amazing! So fresh and so healthy. Pinning to make for dinner soon!